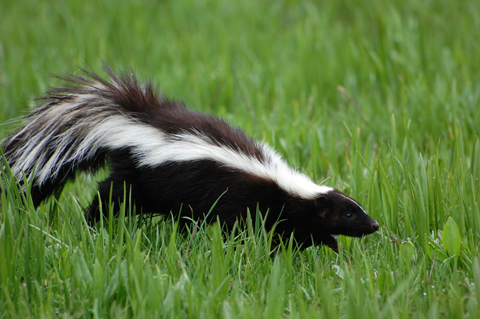 Due to its scavenging nature, skunks can eat anything from garbage to bugs. If skunks happen to get a morsel in your garden, then be assured that they will revisit the place. Due to this revisiting, they can make your garden a feeding place. The fact remains that you have to remove skunks from your garden, but again you have to remove it in a humane way like Skunk removal Toronto experts do it. One of the factors to consider before removing skunks from your garden is how to trap it. Since you have to take care of its life, then you have to set a trap. Use bait in spring-loaded skunk traps to lure the skunk in. After this, you will close the door behind to make sure escape is not achieved. You are now free to carry the skunk out of your garden and set free it in another open but wild area. For bait that will attract skunk, more easily can be canned sardines, peanut butter, cat food or any other strong smelling food. Traps that are designed for feral cats, raccoons and other untamed animals can also work well for skunks. In doing this, you will have eradicated skunks, but in a more humane manner. If the above method is not the best for you, and your wish is just to drive a way skunks from your garden, then consider the following methods. Install sprinklers that are motion activated. They turn on immediately an animal wonders near it. This method is safe and will always keep skunks away from your garden. You can as well use lights. Fortunately, skunks are nocturnal and so they shy away from brighter lights. If you light your garden, then be assured of driving away skunks. If all the above does not apply, feel free to contact wild life service expertise.